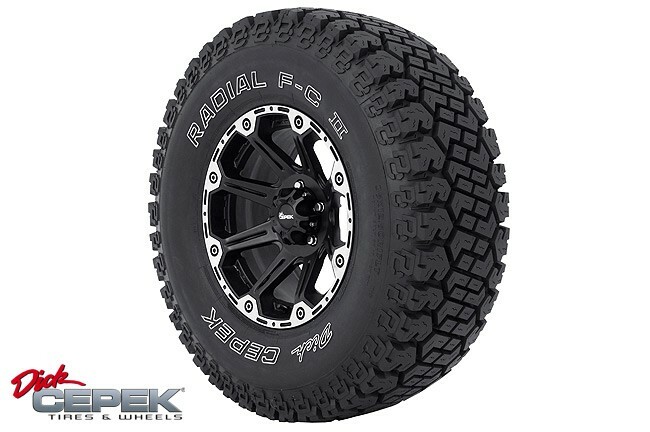 With it's unique "hybrid" design between an all-terrain and mud terrain, the Radial F-C II has proven to be a real "Any Terrain" radial. This is one tough tire! Specialty Light Truck (SLT) Sizes Feature 3-Ply Sidewalls with crossply technology for better handling, increase puncture and tear resistance at the sidewall, and better towing capabilities. Advanced Radial Construction for High Mileage & Smooth Ride. Built on a Mud Tire Carcass which Provides an Extra Deep Tread for a Longer Lasting Tire and Higher Load Ratings. Self Cleaning Tread with "Stone Kickers" for Offroad Traction. Extra Wide Footprint for Better Traction and Even Wear. Trademark "DC" Sidebiters® For Added Traction & Protection. Siped Tread Lugs for Better Grip on Smooth Surfaces and Ice. Specialty Light Truck (SLT) Sizing Features 3-ply Sidewalls with Cross-ply Technologoy for Better Handling, Increased Puncture and Tear Resistance at the Sidewall, and Better Towing Capabilities. High Load Ratings on (SLT) Sizing for Greater Towing Capabilities.